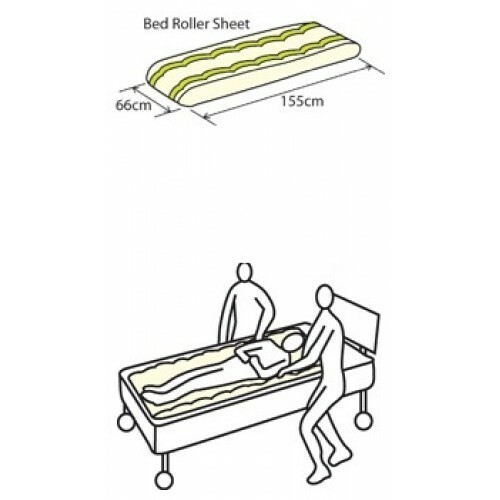 The Bed Roller Sheet can be used to move a heavy patient up or across a bed, sit them up, turn them, and help them get out of bed without pulling the patient's body, arms or legs, and without Carers having to lift. The Bed Roller Sheet is left under the patient's Bed Pad (Kylie) and Waterproof Mac, or a Draw Sheet so it is always easy to use, with minimum disturbance to the patient. It is made from a strong nylon material. It is wide enough for a patient to lie on. Webbing handles are on both sides of the Sheet around the full length, and these are used to turn or slide the patient. Use the Bed Roller Sheet Wide Size for very tall patients when turning side to side.